Is LottoFun.com a Scam or Legit? Read 2 Reviews! Looking to bet on lotteries online, LottoFun.com offers 29 international games both through single tickets or group play. Keep in mind for the US and Spanish lotteries, taxes still do apply even though LottoFun is not collecting winnings from an actual ticket but instead going to their insurer to cover the jackpot. Oh – and beware the subscription button for combo play. This is a betting site for online lotteries either through the internet on your PC or through the app on your smartphone. There are 29 international lotteries to choose from including the US mega jackpots, EuroJackpot & EuroMillions, plus Australia, South Africa, Turkey, and Poland to name a few. Gotta love a lottery called “Hoosier”. Players can choose to play 1 or more tickets lines for 1, 4, 8 or 24 draws. Nice – the subscription button is turned off so it is up to you whether you want to turn it on. Each of the group play options has 100 shares with 100 lines for all 29 lotteries offered at LottoFun. Players can opt in for 1, 4, 8 or 24 games. Ticket lines are randomly chosen. Players can also opt to a subscription – again it is turned off. 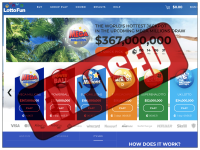 LottoFun.com has 4 combo options – American Dream, Mega 7, Mega Euro and Mega World. Each can be played 1, 2 or 4 weeks. Make sure you are aware of the subscription button as it’s already on. If you don’t want to subscribe – turn it off! LottoFun.com uses the official lottery published prize tier for winnings. The only difference is for the jackpot, they factor in other winners. For example, if the official lottery has 1 winner and LottoFun has 1 winner, then the LottoFun winner gets 50% of the published jackpot. Where a lottery has taxation applied, this will be deducted prior to getting your winners. Where the lowest tier prize would be a ticket, players get a cash prize. Withdrawing your winnings seems fairly simple. It can take up to three business days to process and then could be another 30 days before you get them. In the case of a jackpot or major prize, it can take up to 90 days for LottoFun to process the payment through their insurer. There is a minimum withdrawal amount of €25.00 through bank transfer. In term and conditions, there was one line that gave me a laugh – “The User has no knowledge about any bet result of the underlying bet before placing it.” I wonder if that includes dreams or deja vu. Players have to register for themselves, his/her account is only for personal use and you can only have one account. Who Can Play at LottoFun? There are the usual players must be 18 years of age or older depending on the legal age to do online gambling in the country you reside. Plus, you can’t play if you’re a resident of Aruba, Bonaire, Curaçao, France, Netherlands, Saba, Statia, St. Martin, the UK, and the US. LottoFun is operated by a company with a registered office in Malta and regulated by the laws of Curaçao. The company in Malta has a snail mail address. Lottofun.com also has an email address, online form and phone numbers for the UK, Netherlands, Russia, and Germany. This looks like a fairly straightforward online lottery betting site. I’d feel a little better if they actually published who their insurer is. I also think that one of the things that would make betting versus buying tickets is if LottoFun took the taxes off the table. This site gets a thumb’s up if you’re into betting on lotteries. Just don’t forget if you choose to play their combo games and you don’t want a subscription – turn it off. I play some group ticket here. I think they are not good, not transparent company. when you have 150 tickets in group, 20 lines have prize, but they paid you 10 line. you email them, email and email, they answer as no answering. 30days to withdraw money. oh my god. you want cash out 20 Eur, and waiting 30days. I have full Screenshots of what I said. they are new in lottery agent, but I think very difficult to compete. they need clear, fair, transparent in their business. One of best and most reliable, user friendly and secure lotto service provider, I am from India found trustworthy site to bet and win lot! One thing, they must give more focus on support system, both, e-mail and as well live chat.